Sony, the Japanese electronics giant, was a pioneer in the current wave of electronic book readers, introducing its first Sony Reader model back in 2006. But, it has been overtaken by Amazon.com, whose Kindle e-book reader, introduced in 2007, has become almost synonymous with the category. Now, Sony (SNE) is out with a much-improved model that could make it more competitive. Unlike the Kindle, Sony’s readers weren’t wireless and their owners couldn’t download books or newspapers directly to the device, instead of via a computer. Now, that problem has finally been solved with Sony’s new Reader Daily Edition, a handsome $400 wireless model that I’ve been testing. The Daily Edition can be bought at Sony’s stores; at its Web site, sonystyle.com; and at Best Buy’s (BBY) site, bestbuy.com. It was sold out for the holidays, but Sony says it expects new stock soon. The Daily Edition isn’t a mere clone of the Kindle. It has a different design philosophy and is stronger in some areas, weaker in others. In general, I enjoyed using it, once I mastered its user interface, which took several days. I especially liked the fact that it packs a larger screen into a comfortably small device, and mostly uses touch navigation instead of all physical controls. For instance, while the Sony does have a small page-turning button, you can more easily turn pages by just swiping your finger across the screen. It’s also better at navigating digital newspapers, something I’ve never found very satisfying on the Kindle. On the downside, the Daily Edition has three main flaws when compared with the Kindle. First, it’s much more expensive—$400 versus just $259. Second, it has only about half of the commercial, copyrighted digital books that Amazon (AMZN) does—around 200,000 versus the Kindle’s roughly 400,000. Sony also throws in a million out-of-copyright, old books, for a total of 1.2 million. But many of these added million titles are obscure and of little interest to mainstream consumers. 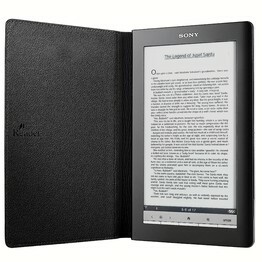 The Reader also has just eight newspapers, versus 92 for the Kindle, though Sony says 10 more are coming soon. Third, the technology that makes the screen touch sensitive also dims it a bit, so the Daily Edition’s screen is darker than the Kindle’s. (Both are unlit monochrome screens with gray-scale graphics.) I found the Sony screen adequate, but it’s tougher to read in lower light. The Daily Edition is a slender device with a black metal body that contrasts sharply with the wider, white plastic body of the Kindle. While both products use the same basic screen technology, and the same screen width, the Daily Edition’s screen is longer; it measures 7 inches versus 6 inches for the Kindle. In my tests, I found this a big advantage, because, when both devices were set for roughly comparable text sizes, the Sony could hold more text on a page, cutting down on the need for page turns, which interrupt reading. In addition, the Daily Edition is narrower than the Kindle, because the borders around the screen are thinner, since they don’t have to accommodate the Kindle’s various large buttons or physical keyboard. (You can enter text for notes or searches on the Daily Edition using a stylus for handwriting or a virtual onscreen keyboard.) This longer, narrower shape gives the new Sony a nice feel in the hand. I also preferred the Sony’s method for presenting newspapers, which allowed more headlines to be viewed at once and required fewer steps to navigate through the paper. The Sony also claims more battery life with wireless turned off, comes with a cover included—an extra-cost item on the Kindle—and can handle more book formats, including the free digital books offered by public libraries. Built-in memory is the same, but the Daily Edition’s can be expanded while the Kindle’s can’t. Like the Kindle, the new Sony also allows you to drag songs, pictures and some personal documents onto the device from your computer. I did this with no problems. The Daily Edition has companion software for buying, reading and storing books on both PCs and Macs. But it has no app for a smart phone, and doesn’t synchronize your last-read place in your book among the reader and the computer. Also, I found the Daily Edition required a harder learning process than the Kindle. First, it takes awhile to get the hang of the touch gestures, partly because they require much more pressure than on, say, an iPhone. Second, using touch to bring up features and menus can be a mystery until you consult the manual. For instance, it took days to discover that you could set a bookmark by double-tapping on the upper right corner. But, all in all, despite its higher price, the Daily Edition is a big leap for Sony and adds another good choice for consumers. Find all of Walt Mossberg’s columns and videos online, free, at the All Things Digital Web site, walt.allthingsd.com. Email mossberg@wsj.com.